Many of the charges against JPMorgan Chase relate directly to ripping off Americans who can least afford it. In 2011, the bank paid $35 million to settle claims that it had overcharged members of the military on their mortgages. The very next year, it paid the government $659 million in a settlement for overcharging veterans hidden fees in mortgage refinancing transactions. That same year the bank agreed to pay $110 million to settle claims that it overcharged customers for overdraft fees. In 2013, the bank settled a raft of charges over ripping off the poor or average American: the bank paid $410 million to the Federal Energy Regulatory Commission to settle claims of bidding manipulation of California and Midwest electricity markets. It also paid $22.1 million to settle claims that it had imposed expensive and unnecessary flood insurance on homeowners whose mortgages were being serviced by the bank. The bank agreed to pay $80 million in fines and $309 million in refunds to customers whom the bank billed for credit monitoring services that the bank never provided. In 2016 the bank agreed to charges by the SEC that it had steered its customers into in-house products where it reaped higher profits without disclosing this conflict to the customer. It paid $267 million to settle these charges. Last year it agreed to pay $16.7 million to settle claims that it had failed to pay overtime to its own workers. We could go on and on but you get the drift. 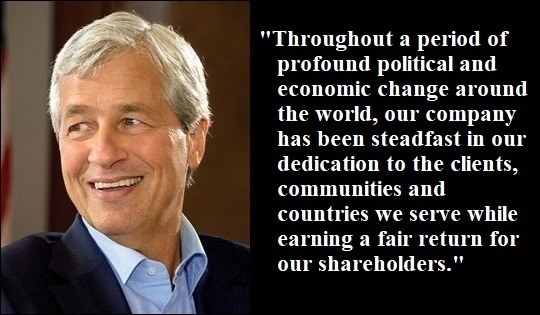 Over this same period of time, Dimon has been richly rewarded in compensation by his bank, with his personal net worth currently projected at $1.3 billion according to Forbes. Given this backdrop, what might account for Dimon’s new-found concern for America’s poor and minorities. Over the past two years, JPMorgan Chase has paid out settlements to quiet claims that it discriminates against minorities. In 2017 it settled a case with the U.S. Justice Department for $53 million. The government said that thousands of African-American and Hispanic borrowers “paid higher rates and fees on Chase mortgages than similarly situated white borrowers.” JPMorgan Chase admitted to the government’s finding that “the bank’s wholesale lending brokers charged minority borrowers more than white borrowers in the same position” which was in violation of the Fair Housing Act. In 2018, JPMorgan Chase settled charges that it had discriminated against its black financial advisers by paying out $24 million. Over the years, Wall Street On Parade has produced an extraordinary amount of evidence to support the premise that the mega Wall Street banks like JPMorgan Chase are little more than an institutionalized wealth transfer system. The fact that the U.S. currently has the greatest wealth inequality since the late 1920s (when the mega banks also ran wild on Wall Street) is further proof that we are correct in our assessment. So let’s take a current look at how Jamie Dimon’s furrowed brow over the plight of the poor in America and his media road show stacks up with his actions inside his bank. According to the bank’s web site, it is offering a pathetic 0.02 percent on Certificates of Deposit (CD) on amounts of $1,000 to $100,000 for one year maturities. It said that its rates might change depending on the locality so we inserted the zip codes on the web site for some of the lowest household income communities in America: Beckley, West Virginia; Jackson, Tennessee; Gadsden, Alabama; Alexandria, Louisiana; and Sebring, Florida. In each instance, for CDs of one year maturity, the bank was offering 0.02 percent. Could the bank offer more interest to its customers and still make a nice profit. It could offer a lot more. Here’s why. As of this morning, the one-year U.S. Treasury Bill has a yield of 2.45 percent. If held to maturity, the instrument is unconditionally guaranteed by the U.S. government. That’s a safe way for a bank that lost $6.2 billion of its depositors’ money by gambling in high-risk derivatives in London to offer a good return while investing its money safely in a similar maturity instrument. It costs a tiny amount of money to buy short-term Treasuries but we’ll give JPMorgan Chase the benefit of the doubt and add a very generous overhead expense (trade cost, physical plant, millions of dollars in bonuses to traders and execs, loan loss reserves for bad bets in London, etc., etc.) of 30 percent of the yield. That still leaves JPMorgan Chase with 1.715 percent to offer on its one-year CDs to customers that are living paycheck to paycheck or social security check to social security check. But for some reason, despite Jamie Dimon’s newfound devotion to noblesse oblige, his bank is paying just 0.02 percent on one-year Certificates of Deposit across the landscape of some of the poorest communities in America. And what about the overall interest that JPMorgan Chase is paying its bank depositors versus what it’s making for itself. According to the bank’s federal filing known as a call report for fiscal year 2018, it had gross interest income of $77.8 billion. Of that amount, it paid a pathetic $4.56 billion on its time deposits and “other” deposits. Bottom line: when it comes to the poor, judge Jamie Dimon on the actions of his bank, not on his noble proclamations to the media.